2x4_Labels is rated 3.7 out of 5 by 3. Rated 1 out of 5 by notred from Not the real color Watch out! The Neon-Red is actually orange (like an orange highlighter). Rated 5 out of 5 by Leslie from Love your products We keep on ordering our supplies from you! Everything's perfect. Thank you. are these similar to avery print-to-the-edge labels? 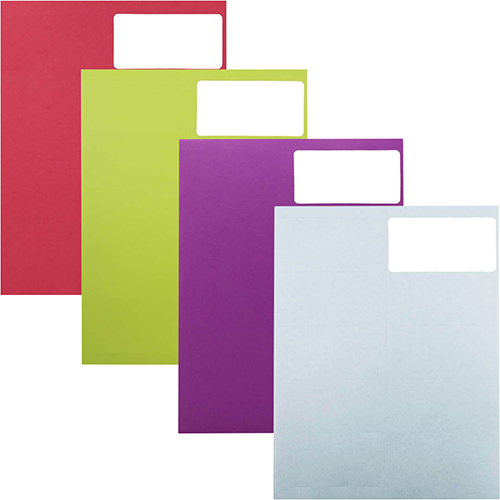 Are these labels removable or easy to remove from a glossy folder surface? They have a very strong adhesive, so I would assume it would be rather difficult to remove them. Great! We have a free downloadable word template for you under the &quot;Labels&quot; section here: http://www.jampaper.com/Templates.asp. Enjoy! Can these be used as nametags or will they ruin clothing? Hello! Yes, these labels can be used as nametags. Thanks for the question! Need to send out a bunch of envelopes, organize your home or office, or package up your things nicely? With our 2 x 4 Rectangular Labels, you can do it all. Featuring an array of stunning colors, from lunar blue to flashy gold foil, all your your vibrant organization and addressing dreams will come true. And for your more laid back labeling, we also carry low-key parchment and kraft. We even have a collection of Neon Labels that will ensure the attention of any and all recipients. So whether you are organizing your storage or sending out a package, these 2 x 4 will certainly help out along the way! Best of all, these labels are computer-compatible, so you don't have to wear out your wrist trying to address hundreds of invitations. 2 x 4 Labels come in packs that contain 120 labels (There are 10 labels per page). Use Avery Template: 5163 in Microsoft Word for easy printing and easier labeling.